Arden Grange Light Adult Dog Food (Chicken & Rice) is a complete and balanced diet for adult dogs that are overweight or prone to gaining weight easily. Made with fresh chicken as a high quality source of protein, Arden Grange Light is lower in calories and contains an increased level of fibre to make your dog feel fuller for longer. The addition of L-Carnitine into the recipe also helps to increase the conversion of fat to energy, and will help your dog to maintain a lean body mass. Great product keeps my Labradors weight under control. Also a great price and quick delivery as always from vet uk will definitely use this site again. 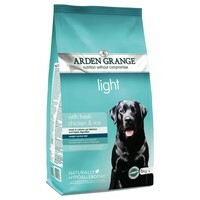 Had to find a hypoallergenic food for my Lab after he developed an upset stomach after a lot of research Arden grange came out top for quality and economy. Not only is his stomach happier, Ness at Arden Grange who is most helpful recommended the light as it's lower in oil, but he actually likes it - and he's an appalling fussy eater so that's a big plus too. Wish I'd discovered their products sooner.